Microsoft are really trying to stick it to Apple, and also claw back some of that marketshare the iPad has just absorbed. Now, Microsoft have started a promotion where it will give you a gift card if you trade in your iPad which can be used against a Surface RT or Surface Pro. Microsoft aren’t being stingy about it either – marketing material shows that Microsoft are willing to pay a minimum of $200 to have you part with your gently used iPad 2, 3, or 4. 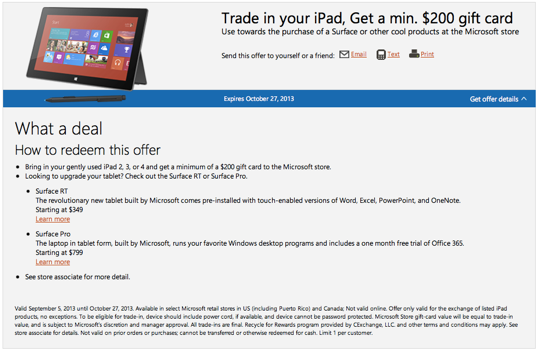 That gift card can then be redeemed off the purchase price of a Surface RT, Surface Pro, or any other Microsoft product. The promotion has been making its rounds via email and seems it is limited to Microsoft retail stores in US and Canada. iPad Trade In – How does it work? Well a Microsoft employee will inspect your iPad, determine its trade-in value (I assume they have some sort of scale for this), and then give you credit on a Microsoft Store Gift Card. All trade-ins are of course final and subject to Microsoft’s discretion and manager approval. It is also worth mentioning that Microsoft said“To be eligible for trade-in, device should include power cord, if available, and device cannot be password protected.”The promotion is limited to one device per customer and expires on October 27th 2013. So for all those out there that have a burning desire to trade in your iPad and just simply haven’t heard of eBay, Craigslist, Gumtree, or all the other second-hand selling sites out there, and absolutely must hand over your iPad to Microsoft (probably for some sort of internal probing) then now’s your chance. But remember, you only have until October 27th 2013 to get your hands on a brand new Surface RT or Surface Pro. Any takers? No didn’t think so. Comments? You know what to do.